We adore the rich and sumptuous artwork by. 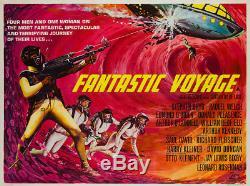 Beauvais for 60s entertaining sci-fi romp Fantastic Voyage. A striking poster that is sure to liven up any room it's hung in. Actual poster size is 30 x 40 (32 x 42 including linen backing). UK Quad (30 x 40 inches). Couple of small repaired tears on left-hand margin. Light touch up to folds. The item "Original Fantastic Voyage, UK Quad, Film/Movie Poster 1960, Tom Beauvais Linen" is in sale since Wednesday, February 14, 2018.